DIY Knife Sharpening Systems are uniquely designed to turn almost any Bench or Pedestal Grinder into a serious Knife Sharpening Machine. Paper Wheels for sharpening knives have been a staple in many shops, garages and even kitchens. DIY Sharpening Wheels are one the most economical sharpening solutions available today. You can extend the life of the gritted wheel by re-gritting when the abrasive has worn off from sharpening. A Gritted Paper Wheel can re-gritted as many as 10 times before needing to be replaced. The DIY Paper Wheels Sharpening System will get your knives razor sharp FAST! These wheels install on any standard 6" bench grinder or buffer. This system is perfect for people who want knives to be sharpened quickly and efficiently. To sharpen a blade make a couple of passes on the gritted wheel, and a couple of passes on the slotted wheel and your knives will be ready to go to work! 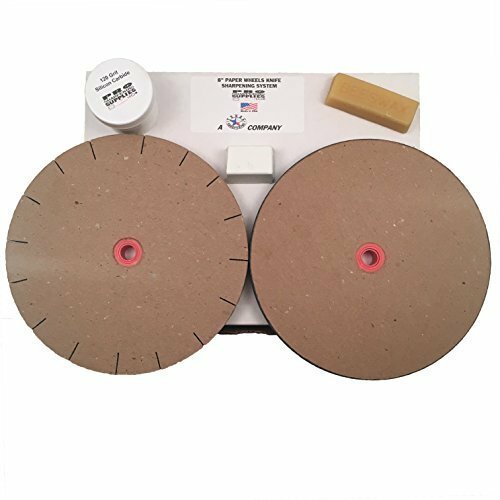 The Paper Wheel Sharpening System is a complete Sharpening system that will turn your bench grinder into a sharpening machine. The Kit contains 2 wheels(1 Gritted paper Wheel, 1 slotted polishing honing paper wheel), Beeswax to lubricate and reduce heat on the gritted wheel, White Diamond Buffing compound, Loose 120 grit Silicone Carbide to re-grit the sharpening wheel and extend the life of the Paper Wheel Sharpening System. At least 30-40 knives can be sharpened on the grit wheel before it needs to be re-gritted. Real Bees Wax (made in Austin, Tx.) is included to provide lubrication for this wheel and keep it from overheating your edge. The slotted wheel can be dressed with the white diamond buffing compound that comes in the Sharpening Kit. The wheel will naturally turn black as it becomes coated in the compound. The White Diamond Buffing Compound will smooth and polish your edge while removing the final burr. This method has been proven to be very effective and fast over the years. Why spend all day messing around with stones and rod guided systems? RAZOR SHARP KNIVES IN LESS THAN A MINUTE | Don't just get your blades sharp, Get them SCARY SHARP! One of the fastest ways to get your knife sharp. This complete sharpening takes your knives from blunt, dull and dangerous and makes the edge like new again. Leaving a finely polished, professional looking edge. Few systems can sharpen a knife from start to finish with this quality. QUIT CHANGING BELTS AND GET TO SHARPENING | This simple two step sharpening system turns your dusty old bench grinder into a real Knife sharpening machine. 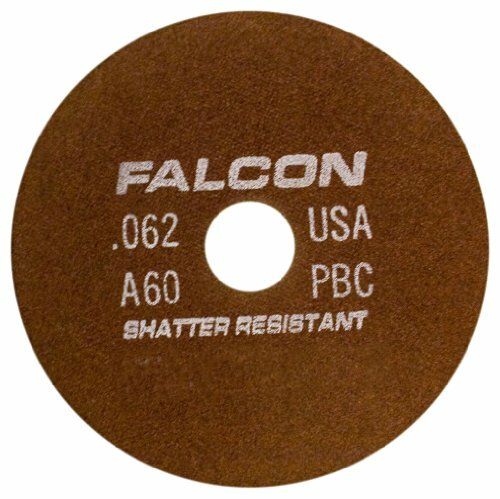 The Gritted Paper Sharpening Wheel uses 120 grit silicon carbide abrasive grain to grind a new edge and create a burr. This is the first crucial step in sharpening. The Paper Polishing Wheel is used to remove the burr and leaves a near mirror finish for a professional sharpening result. 100% SATISFACTION GUARANTEE | If you are not completely satisfied with your Paper Wheel Knife & Tool Sharpening System contact us or simply simply return the item for a full refund. 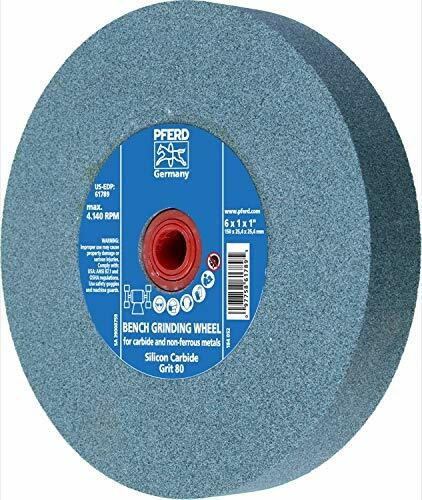 PFERD bench grinding wheel is made of green silicon carbide in a vitrified bond. These product is particularly suited for carbide and non-ferrous metals like titanium. Advantages: Very good self-sharpening performance. Long service life because of hard silicon carbide. High stock removal rate. Application: Removing of burrs Sharpening of carbide tools like drills, mills or disposable tips. Various maintenance applications. Dressing diamond tools for tool-grinding machines. Recommendations for use: All bench wheels are packed with telescoping bushings to accommodate popular machine spindle sizes. If a bench grinding wheel starts to show signs of loading, use dressing stones on page 28. Suitable tool drives are bench and pedestal grinders. Specification: 8" Diameter; 1" Thick; 1-1/4" Arbor Hole; 120 Grit; 3600 RPM Maximum Rotational Speed. 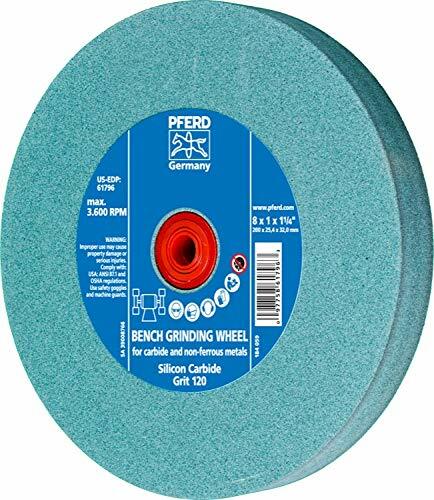 PFERD bench grinding wheel is made of green silicon carbide in a vitrified bond. These product is particularly suited for carbide and non-ferrous metals like titanium. Advantages: Very good self-sharpening performance. Long service life because of hard silicon carbide. High stock removal rate. Application: Removing of burrs Sharpening of carbide tools like drills, mills or disposable tips. Various maintenance applications. Dressing diamond tools for tool-grinding machines. Recommendations for use: All bench wheels are packed with telescoping bushings to accommodate popular machine spindle sizes. If a bench grinding wheel starts to show signs of loading, use dressing stones on page 28. Suitable tool drives are bench and pedestal grinders. Specification: 6" Diameter; 3/4" Thick; 1" Arbor Hole; 120 Grit; 4140 RPM Maximum Rotational Speed. 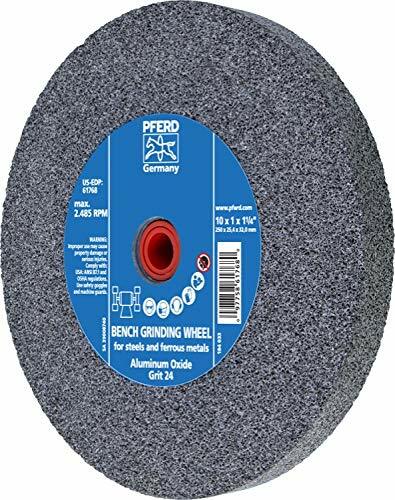 PFERD Bench grinding wheel is made of regular aluminum oxide in a vitrified bond. These products are particularly suited for high-speed steel (HSS), steel, cast steel and cast iron. Application: Deburring at semi-finished steel and cast products. Regrinding and sharpening of HSS tools like drills and turning tools. Various maintenance applications. Recommendations for use: If a bench grinding wheel starts to show signs of loading, use dressing stones on page 28. Suitable tool drives are bench and pedestal grinders. Safety recommendations: The maximum speed is calculated in accordance with ANSI B7.1. Never exceed the maximum RPM listed on wheel labels. CAUTION: Smaller spindles frequently run at higher RPMs. Prior to mounting, all wheels shall be visually inspected for damage and cracks. Perform the ring test before mounting. An undamaged wheel will give a clear tone. Specification: 6" Diameter; 1" Thick; 1" Arbor Hole; 24 Grit; 4140 RPM Maximum Rotational Speed. Pro Sharpening Supplies 6 Leather Honing & Polishing Now Included to Bring your Blade to a Mirror Finish with a Razor Sharp Edge. 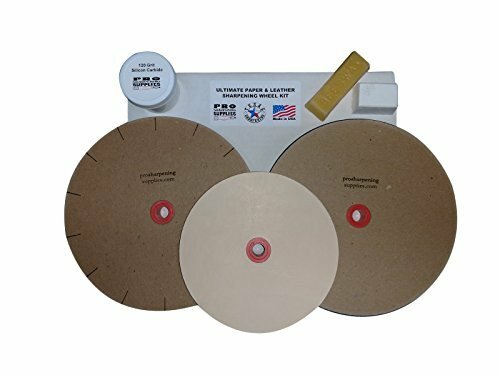 The Ultimate Sharpening Wheel Kit Can Sharpen Hundreds of Knives by Re-gritting the Sharpening Wheel as Needed. 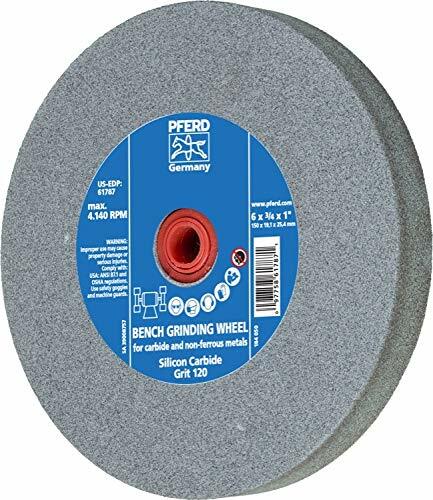 PFERD Bench grinding wheel is made of regular aluminum oxide in a vitrified bond. These products are particularly suited for high-speed steel (HSS), steel, cast steel and cast iron. Application: Deburring at semi-finished steel and cast products. Regrinding and sharpening of HSS tools like drills and turning tools. Various maintenance applications. Recommendations for use: If a bench grinding wheel starts to show signs of loading, use dressing stones on page 28. Suitable tool drives are bench and pedestal grinders. Safety recommendations: The maximum speed is calculated in accordance with ANSI B7.1. Never exceed the maximum RPM listed on wheel labels. CAUTION: Smaller spindles frequently run at higher RPMs. Prior to mounting, all wheels shall be visually inspected for damage and cracks. Perform the ring test before mounting. An undamaged wheel will give a clear tone. Specification: 10" Diameter; 1" Thick; 1-1/4" Arbor Hole; 24 Grit; 2485 RPM Maximum Rotational Speed. silicon carbide bench grinding wheels are ideal for small job shops and numerous general-purpose applications. Made of premium Green silicon carbide, these superb wheels get the job done - effectively and efficiently! these super-hard, precision accessories minimize material loss and maximize grinding-assembly performance, thus maintaining your valuable tools in optimum condition. And they are conveniently designed to fit most stationary bench grinders. 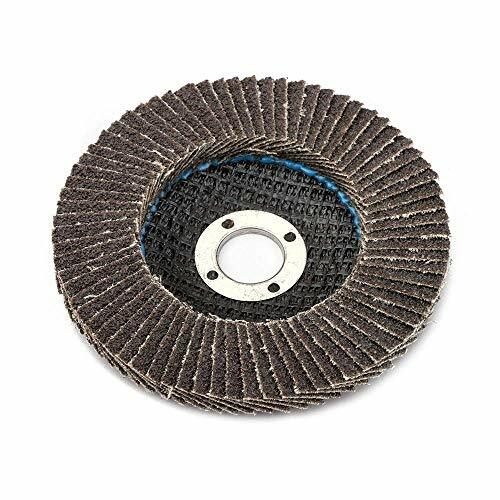 Reduce effort and increase satisfaction with these top-notch grinding wheels - perfect for tool and Cutter grinding of cemented carbide applications. OUR ABRASIVE WHEELS DESIGNED FOR USE ON RUST, paint, steel, and non-ferrous metals, along with any other surface that needs sanding. 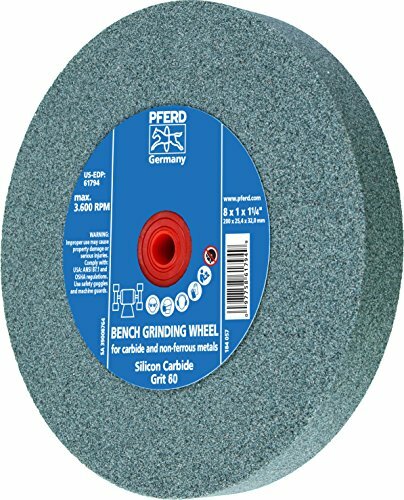 PFERD bench grinding wheel is made of green silicon carbide in a vitrified bond. These product is particularly suited for carbide and non-ferrous metals like titanium. Advantages: Very good self-sharpening performance. Long service life because of hard silicon carbide. High stock removal rate. Application: Removing of burrs Sharpening of carbide tools like drills, mills or disposable tips. Various maintenance applications. Dressing diamond tools for tool-grinding machines. Recommendations for use: All bench wheels are packed with telescoping bushings to accommodate popular machine spindle sizes. If a bench grinding wheel starts to show signs of loading, use dressing stones on page 28. Suitable tool drives are bench and pedestal grinders. Specification: 6" Diameter; 1" Thick; 1" Arbor Hole; 80 Grit; 4140 RPM Maximum Rotational Speed. 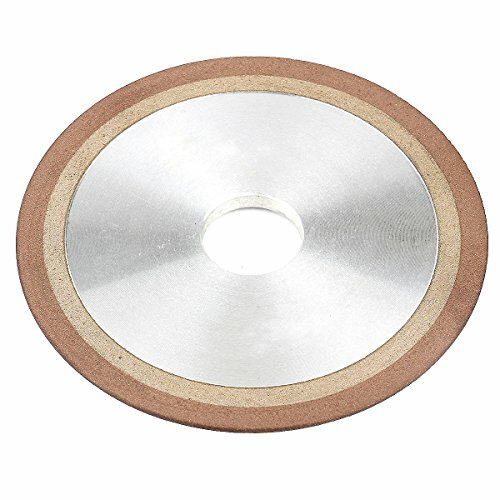 Norton Type 01 vitrified straight toolroom grinding wheel. Used on surface, cylindrical, and tool and cutter grinders, Norton precision, form-holding vitrified toolroom wheels maximize your productivity. For every ferrous and nonferrous MRO, small job shop, and production operation. Better choice for medium to heavy stock removal. Sharp monocrystalline aluminum oxide grain the industry's most versatile abrasive purple. Free cutting on a wide range of applications and materials. Outstanding form holding. Measures 8-inches diameter by 1/4-inches width, 1-1/4-inches arbor. Precision cutting and slotting wheels. Internal reinforced to perform like non-reinforced wheels while providing a safe environment for the machine operator. For use with stationary machines such as bench grinders and tool post grinders. Standard thickness manufactured at +/- 0.005 to tolerance. Specially bonded for cool burn-free cutting. High Precision Cutting and Slotting. Provides longer wheel life. Fine-finish burr free cutting. Less wheel changes. Safety increased from non-reinforced type wheels. These wheels are used for cutting tubing, angle, square, and flat shaped materials. Used to cut steels, tool steels, and aircraft steels: 4140, 4340, etc. For use with stationary machines such as bench grinders and tool post grinders. PFERD bench grinding wheel is made of green silicon carbide in a vitrified bond. These product is particularly suited for carbide and non-ferrous metals like titanium. Advantages: Very good self-sharpening performance. Long service life because of hard silicon carbide. High stock removal rate. Application: Removing of burrs Sharpening of carbide tools like drills, mills or disposable tips. Various maintenance applications. Dressing diamond tools for tool-grinding machines. Recommendations for use: All bench wheels are packed with telescoping bushings to accommodate popular machine spindle sizes. If a bench grinding wheel starts to show signs of loading, use dressing stones on page 28. Suitable tool drives are bench and pedestal grinders. Specification: 8" Diameter; 1" Thick; 1-1/4" Arbor Hole; 80 Grit; 3600 RPM Maximum Rotational Speed. 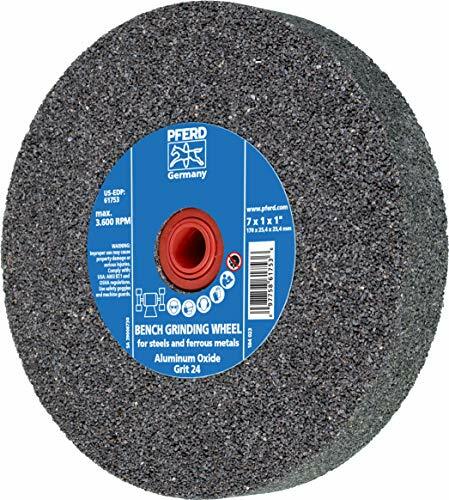 PFERD Bench grinding wheel is made of regular aluminum oxide in a vitrified bond. These products are particularly suited for high-speed steel (HSS), steel, cast steel and cast iron. Application: Deburring at semi-finished steel and cast products. Regrinding and sharpening of HSS tools like drills and turning tools. Various maintenance applications. Recommendations for use: If a bench grinding wheel starts to show signs of loading, use dressing stones on page 28. Suitable tool drives are bench and pedestal grinders. Safety recommendations: The maximum speed is calculated in accordance with ANSI B7.1. Never exceed the maximum RPM listed on wheel labels. CAUTION: Smaller spindles frequently run at higher RPMs. Prior to mounting, all wheels shall be visually inspected for damage and cracks. Perform the ring test before mounting. An undamaged wheel will give a clear tone. Specification: 10" Diameter; 1" Thick; 1-1/4" Arbor Hole; 60 Grit; 2485 RPM Maximum Rotational Speed. Norton Type 01 vitrified straight toolroom grinding wheel. Used on surface, cylindrical, and tool and cutter grinders, Norton precision, form-holding vitrified toolroom wheels maximize your productivity. For every ferrous and nonferrous MRO, small job shop, and production operation. Better choice for medium to heavy stock removal. Sharp monocrystalline aluminum oxide grain the industry's most versatile abrasive purple. Free cutting on a wide range of applications and materials. Outstanding form holding. Measures 7-inches diameter by 1/2-inches width, 1-1/4-inches arbor. 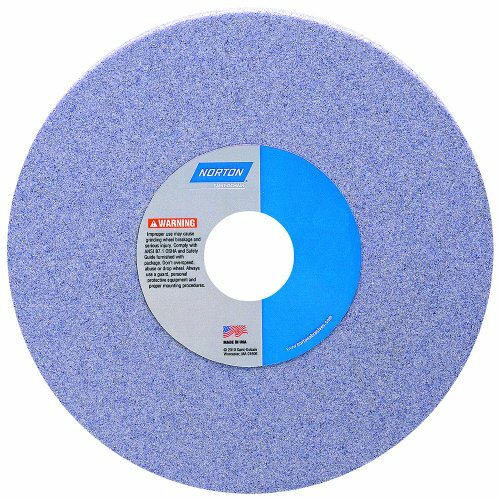 Norton Type 01 vitrified straight toolroom grinding wheel. Used on surface, cylindrical, and tool and cutter grinders, Norton precision, form-holding vitrified toolroom wheels maximize your productivity. For every ferrous and nonferrous MRO, small job shop, and production operation. Better choice for medium to heavy stock removal. Sharp monocrystalline aluminum oxide grain the industry's most versatile abrasive purple. Free cutting on a wide range of applications and materials. Outstanding form holding. Measures 7-inches diameter by 1/4-inches width, 1-1/4-inches arbor. 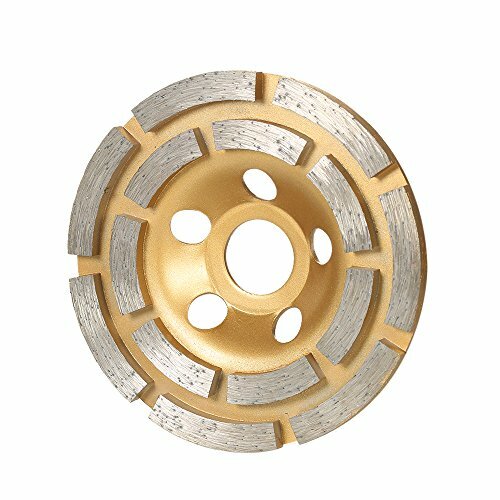 High quality and brand new diamond segment grinding wheel cup with high speed grinding and long service life. With air holes designed to aid in and maintain a cool stable cutting pattern and reduced wear. Designed to provide 30% faster stock removal with double row large grinding segments. Processed with high quality synthetic diamond coating that provides for a more consistent diamond scratch pattern. 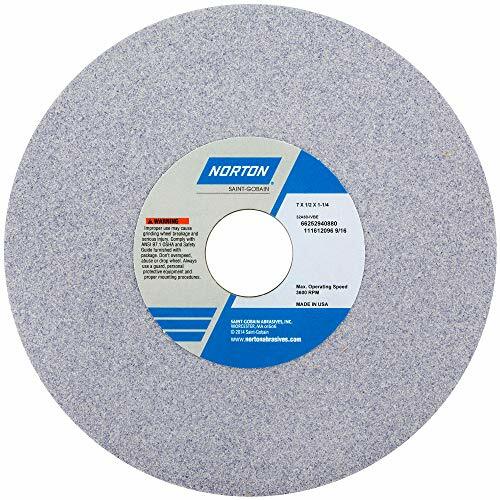 Norton Type 01 vitrified straight toolroom grinding wheel. Used on surface, cylindrical, and tool and cutter grinders, Norton precision, form-holding vitrified toolroom wheels maximize your productivity. For every ferrous and nonferrous MRO, small job shop, and production operation. Exceptionally high-performance proprietary seeded gel ceramic aluminum oxide abrasive. Self-sharpening abrasive. High performance VS bond. Provide sharp edge on tools and dies. Durable Norton SG and aluminum oxide blend. Fast stock removal, cool, superior cutting. 3X - 5X more life than aluminum oxide wheels. Double rough stock removal rate versus conventional abrasives. Less burn, less dressing; very consistent performing wheel. Versatile; exceptional form holding. Longer life of tools and dies in production. High stock removal rates, excellent productivity, long wheel life, low overall grinding cost. Maximum productivity in heat-sensitive, heavy stock removal operations. Measures 7-inches diameter by 1/4-inches width, 1-1/4-inches arbor.